Such simple words, but they pack a punch, don't you think so? Well, here is the lady behind these wonderful verses- Subhashini. I've known her as @neelavanam and follow her on Twitter. How did I connect with her? One day, a few words strung together singing a song caught my eye and I was hooked. And everyday I along with her many other followers would eagerly look forward to the verse she shared on twitter. I dabble in a bit of poetry and so it was a lovely feeling connecting with another person who liked it as much, if not more. One day last month? or was it few weeks ago? She announced her book was out, it was a collection of her micropoetry.. I knew I had to get my hands on it, and before I knew it I was holding it in my palm. 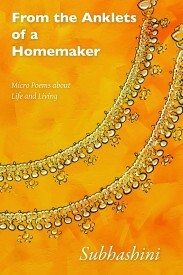 "From the Anklets of a Homemaker"
Honestly, the book was such a breeze to read perfect with a cup of filter kaapi or maybe a mojito. Sit by the window, let the breeze tease your senses and you will enjoy this book immensely. The poems within the book are divided into three sections - Reflections of a Summer Rain, Rivers of endless desire, Meditations. Even though I felt some poems could be interchanged, am sure the author had her reasons for placing them where she did. not the fears of a weary heart"
reflections of moving clouds ~delicious"
You need to read and pick the ones you enjoyed! Since I write the occasional poem, I know that some sound poetic and some very prose. There are sentences that you could rap, and some that read like a story. That is the beauty of poetry- no set rules, just speak your mind and watch the words take their twists & turns. I don't look for rhyme, nor do I look for a pattern, maybe that is why I liked this book a lot!